A few years ago, before the most recent events, this school bus was on the back of a flat-bed tow truck. It was parked at Gallery Place near the McDonalds. There was no sign explaining it. The bus appeared as if it had been hit multiple times by gunfire. I assumed it was art destined for some show. I took a photo. A 2013 story in the Washington Post explained it. . 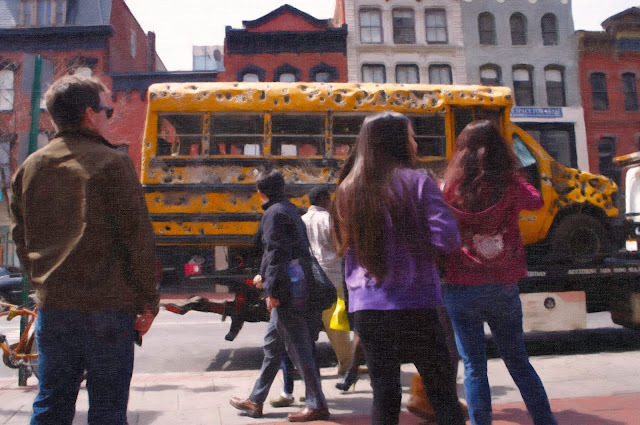 The story: "Bullet-riddle school bus debuts in D.C. as a rolling art exhibit." After the recent events in Texas, and before that Parkland, this art exhibit almost seems as telling as it is chilling. These shootings, as most have observed, are now routine. The children expect them. They also expect nothing from our elected leaders in response. Change is coming.